On Friday morning again the Town Clerk and City Council of Georgetown faced off in a clash and heated exchange over plans to relocate vendors outside of the Stabroek Market and restore order to the Market square. 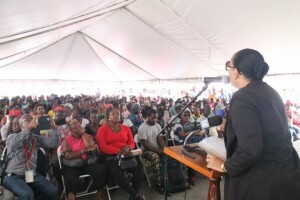 After vendors protested over the past few days over the move, the Town Clerk Royston King and Mayor Patricia Chase Greene hosted the vendors at a meeting to settle the qualms and concerns raised by the vendors. However that meeting left the vendors divided over their future with some accepting the move while others are out rightly against it. “There are some things all of us will have to understand and appreciate. 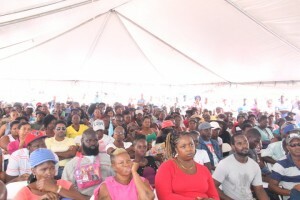 First of all the current situation…we are in the process of finalizing the preparation of the land where we will be relocating the vendors who once plied their trade around the Stabroek Market and the immediate periphery,” said King as he addressed those gathered. The Town Clerk said that the council has gone to great lengths to ensure that area identified for vendors is properly outfitted for their use come Saturday. While close to 300 vendors are being displaced; the new spot can only accommodate 150 vendors, according to the Town Clerk. He was clear that no one will be allowed to return to the Stabroek Market Square to ply their trade. 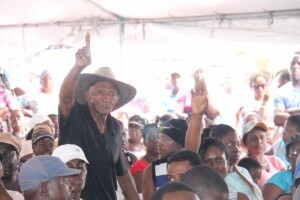 “No one will be allowed to that particular square to do business…the Stabroek Market square will be fitted as a civic square for the benefit and pride of all Guyanese,” he stated. 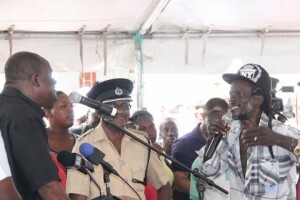 Vendors will have to pay a weekly cleansing fee of $1000 to occupy the land. “We are not in the business of putting anybody out of bread…you have to make a living and we have the responsibility of keeping this city clean,” said the Town Clerk noting that “Centipedes, rats and roaches” have been found among vendors properties. There was loud rumbling of discontent among the vendors as Mayor Greene rose to address the crowd. She made it clear that the City Council will not bow to the wishes of the vendors since there is a larger populace that needs to be satisfied with the clearing up of the Stabroek Square. “The administration has a job to do…the administration has a job to do…Politicians cannot give in to ten when you have 10,000 to please…we cannot allow an unhealthy situation to continue,” she bluntly stated. “We care and because we care we have to make the decisions we’re making,” she added.